Did you know that Mr. 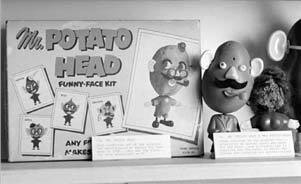 Potato Head was the first toy ever advertised on TV? The popular children’s toy was invented by George Lerner and first manufactured and marketed by Hasbro in 1952. The concept of pronged pieces that could be inserted into a real potato to create the classic figure was later changed in the 1960s due to safety concerns and the plastic body in the shape of a potato was added. The character is well known by kids today, partly due to being prominently featured in the Toy Story Franchise. The Adventures of Mr. Potato Head, a traveling exhibit created by the Betty Binn Children’s Museaum of Milwaukee which debuted in 2008, features the classic toy character as an astronaut, explorer, and more, for a hands-on learning experience. The exhibit was featured in Indianapolis and Baltimore in 2012.